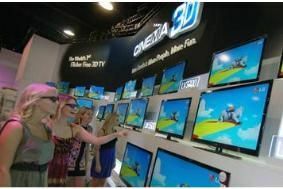 KOREA: LG reveals 'Flicker Free' 3D TV ambitions | What Hi-Fi? That's the fighting talk from the head of the company's home entertainment division, Havis Kwon, speaking in Seoul yesterday. He announced that the company plans on selling 5m 3D TVs in 2011, and will drop the active-shutter technology it currently uses by this Autumn. He was speaking at the Korean launch of LG's first TV using its Film Patterned Retarder technology, which the company says will solve the problems of blurred and flickering 3D images experienced by consumers using existing active-shutter sets. The FPR sets can deliver a 3D image using passive polarised glasses, like those currently used for 3D sports in pubs and for movies in cinemas: these are both lighter than active shutter designs and much less expensive, LG suggesting that the glasses will be around $10 (under £7), and as little as a third of the weight of active models. The plans for FPR are part of LG's efforts to increase its TV sales, as well as improving the profitability of its TV division, which showed a loss in the last three months of 2010 as a result of weaker demand in the worldwide TV market and intensive price competition. LG is aiming for sales of up to 35m LCD TVs, and 4.4m plasma sets, this year, as well as grabbing 20% of the 'smart TV' market. That target of 5m 3D sets looks ambitious, given that the 2011 global market for 3D TVs is estimated at around 14m units, and Korean rival Samsung, the TV market leader, is targeting sales of 8-9m 3D TVs. It's also thought the push to FPR will be resisted by Samsung, which is sticking to – and refining – conventional active shutter technology, as well as the big Japanese players in the 3D TV market, Panasonic and Sony.